The CD86 antigen (B7-2, B70) is a single-chain trans-membrane glycoprotein, structurally similar to CD80. Its molecular weight is 80 kDa, under reducing conditions. The extracellular region is composed of one V-type and one C-type Ig-like domains. There are 8 potential sites for N-glycosylation. The cytoplasmic tail has 3 potential sites for protein kinase C phosphorylation. CD86 shares with the CD80 molecule the same co-receptors on T cells, CD28 and CD152 (CTLA-4). 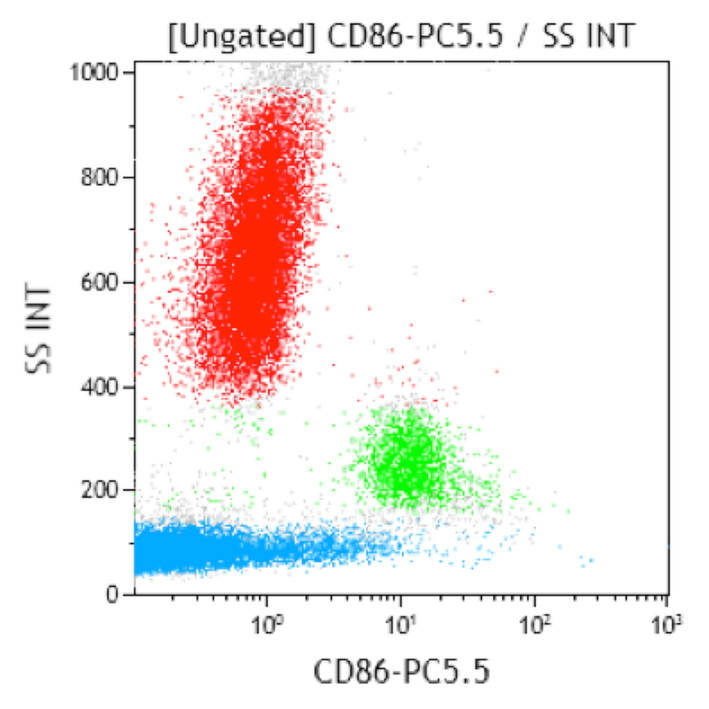 CD86 binds to CD152 with a 20-100-fold higher affinity than to CD28. CD86 is expressed constitutively by interdigitating dendritic cells, and at lower level by peripheral blood dendritic cells. It is strongly expressed by monocytes. On lymphocytes, CD86 appears as a B-cell activation antigen. CD86 is preferentially expressed by memory B cells and germinal center B cells, but not on plasma cells. Its expression can be up-regulated by activation through surface immunoglobulin, CD40, MHC class II molecules or by PMA with ionomycin. T cells activated by CD3 ligation have also been reported to express CD86.